Coyotes are curious creatures. You can be nearly certain if one crosses your path, it will continue for a short distance, stop, turn, and watch you. 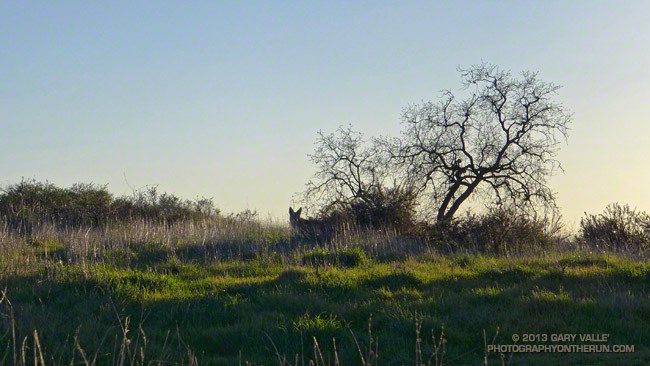 Recently I had another interesting coyote encounter. I was running along East Las Virgenes Canyon fire road in growing darkness, hoping to make it back to the Victory trailhead before it was completely dark. I don’t know if I heard something, but for some reason I stopped running and listened. There was a small gully full of brush to my right that intersected the dirt road. In a moment or two I heard a growing rustling coming up the gully. I was transfixed. It sounded as if some huge animal was coming toward me. The rustling grew louder and louder and the brush began to shake, showing the progress of the creature. It all happened before I had time to react, and even if I could have reacted I don’t know what I would have done! All of a sudden one coyote and then another exploded from the brush. The first crossed direcly in from of me in a full gallop and the second took flight, making an impossible flying bound across the road and up the roadcut on the opposite side. As quickly as they had appeared, they were gone, and the canyon was quiet again.